NOTIFICATION: National Seeds Corporation Limited (NSCL), New Delhi (A Government of India, Ministry of Agriculture & Farmers Welfare) inviting online applications for filling up 264 vacant posts of Deputy General Manager (DGM) (Vigilance), Assistant (Legal) Grade-I, Management Trainee, Senior Trainee, Diploma Trainee, Trainee and Trainee Mate on direct recruitment basis at Corporate Office (New Delhi), Regional / Area Offices and Farms (located all over India) from eligible and interested willing candidates. It is latest & good information for unemployed personnel those who are looking for these new Jobs in Government sector & other organizations. Job seekers, who wish to apply for these vacancies regarding NSCL Recruitment 2019, must have passed MBA/ PG Degree/ Diploma/ MSW/ MA/ LLB/B.Sc/PG Degree/ Diploma/M.Sc (Agri)/ITI/Sr. Secondary/BCA with Computer Knowledge and a required experience. Applicant’s upper age should be as per Govt. rules and age relaxation is applicable to all reserved category candidates i.e.SC /ST /OBC/ PWH/ Ex Servicemen /Women candidates etc. NO OF POSTS: 264 vacant posts Deputy General Manager (DGM) (Vigilance), Assistant (Legal) Grade-I, Management Trainee, Senior Trainee, Diploma Trainee, Trainee and Trainee Mate in National Seeds Corporation Limited (NSCL), New Delhi. 1. Management Trainee (Production) – 05 Posts. 2. Management Trainee (Marketing) – 05 Posts. 3. Management Trainee (Human Resource) – 02 Posts. 4. Management Trainee (Legal) – 01 Post. 5. Management Trainee (Quality Control) – 05 Posts. 6. Sr. Trainee (Agriculture) – 49 Posts. 7. Sr. Trainee (Human Resource) – 05 Posts. 8. Sr. Trainee (Logistics) – 12 Posts. 9. Sr. Trainee (Quality Control) – 19 Posts. 10. Diploma Trainee (Electrical Engg.) – 02 Posts. 11. Trainee (Agriculture) – 45 Posts. 12. Trainee (Marketing) – 32 Posts. 13. Trainee (Agri Stores) – 16 Posts. 14. Trainee (Technician) – 16 Posts. 15. Trainee (Store) Engg – 05 Posts. 16. Trainee (Steno) – 08 Posts. 17. Trainee (Quality Control) – 07 Posts. 18. Trainee (DEO) – 03 Posts. 19. Trainee Mate (Agriculture) – 18 Posts. 20. Assistant (Legal) – 04 Posts. 1. Deputy General Manager (Vigilance): A passed of MBA/ Two years PG Degree/Diploma in Industrial Relations/Personnel Management/Labour Welfare / MSW/MA (Public admin)/LlB from a recognised University/Institution with minimum of 60% marks and 10 years experience. 2. Assistant (Legal) Grade-I: A passed of Professional degree in Law from any recognized University with 01 year experience in handling of legal matters in a reputed organization or with experienced Advocate. Knowledge of Computer (MS office) shall be desirable. The departmental candidates who are law graduates working in the next below post for 2 years having aptitude to work in Legal Department will also be considered on merits, along with others. 3. Management Trainees (Production): A passed of B.Sc.(Agri.) + MBA (Agri. Business Management) OR M.Sc.(Agri.) with specialization in Agronomy/Seed Technology/Plant Breeding & Genetics from a recognized University/ Institution with minimum 60% marks. Knowledge of Computer (MS Office) is mandatory. 4. Management Trainee (Marketing): A passed of B.Sc. (Agri.) + MBA (Mktg./Agri. Business Management) full time or Two years Full time PG Degree/Diploma in Marketing/Agri. Business Management OR M.Sc. (Agri.) from a recognized University/Institutions with minimum 60% marks. Knowledge of Computer (MS Office) is mandatory. 5. Management Trainee (Human Resource): A passed of 2 years full time PG Degree / Diploma in Personnel Management /Industrial Relations/ Labour Welfare / HR Management OR 2 years full time MBA (HRM) from a recognized University/ Institution with minimum 60% marks. Knowledge of Computer (MS Office) is mandatory. 6. Management Trainee (Legal): A passed of Professional Degree in Law from a recognized Indian University/Institution with minimum 55% marks. Knowledge of Computer (MS Office) is mandatory. 7. Management Trainee (Quality Control): A passed of M.Sc.(Agri.) with specialization in Agronomy / Seed Technology / Plant Breeding & Genetics from a recognized University / Institution with minimum 60% marks. Knowledge of Computer (MS Office) is mandatory. 8. Senior Trainees (Agriculture): A passed of M.Sc.(Agri.) with specilaization in Agronomy / Seed Tech./Plant Breeding & Genetics with minimum 55% marks from a recognised University/ Institution. Knowledge of Computer (MS Office) is mandatory. 9. Senior Trainees (Human Resource): A passed of MBA (HR) / Two years full time Post Graduate Degree/Diploma in Industrial Relations / Personnel Management/ Labour Welfare / MSW with minimum 55% marks from a recognised University /Institution. Knowledge of Computer (MS Office) is mandatory. 10. Senior Trainees (Logistics): A passed of MBA (Materials Management/Logistics & Supply Chain Management /Supply Chain Management) OR B.Sc. (Agri.) with MBA (Agri. Business Management) with minimum 55% marks in both from a recognised University/ Institution. Knowledge of Computer (MS Office) is mandatory. 11. Senior Trainees (Quality Control): A passed of M.Sc.(Agri.) with specilaization in Agronomy / Seed Tech. / Plant Breeding & Genetics with a minimum of 55% marks from a recognized University/Institution. Knowledge of Computer (MS Office) is mandatory. 12. Diploma Trainees (Electrical Engineering): A passed of 3 years Diploma in Electrical Engineering/ Electrical & Electronics Engineering with minimum 55% marks from a Govt. recognized Polytechnic /Institution. Knowledge of Computer (MS Office) is mandatory. 13. Trainees (Agriculture/ Marketing/ Agri. Stores): A passed of B.Sc. (Agri.) with minimum 60% marks from recognised University. Knowledge of Computer (MS Office) is mandatory. 14. Trainee (Technician): A passed of ITI certificate in relevant trade of Diesel Mechanic/ Tractor Mechanic, Machineman, Auto Electrician, Welder, Blacksmith with minimum 60% marks and one year trade apprenticeship training in any industry and passed NAC Examination conducted by National Council for Vocational Training (NCVT). Knowledge of Computer (MS Office) is mandatory. 15. Trainee (Stores) Engineering: A passed of Diploma in Agriculture Engineering/ Mechanical Engineering with minimum 60% marks from Govt. recognised Polytechnic/ Institution. Knowledge of Computer (MS Office) is mandatory. 16. Trainee (Quality Control): A passed of B.Sc.(Agri.) with minimum 60%marks from a recognized Computer (MS Office) is mandatory. Knowledge of Computer (MS Office) is mandatory. 17. Trainee (Data Entry Operator): A passed of BCA/ B.Sc. (Computer Science/IT) OR 3 years Diploma in Engg. in (Computer Application / Computer Science /IT / Electronics) OR Graduate with 1 year Diploma in Computer Applications from a recognised University/ Institution with minimum 60% marks. 18. Trainee (Stenographer): A passed of 12th class or Sr. Secondary & equivalent with 3 years Diploma in Office Management with minimum of 60% marks with Stenography from Govt. recognized Polytechnic OR Graduate from a recognized university with a minimum of 60% marks preferably with Certificate course of Stenography. Proficiency in computer operation (including MS Office) working knowledge of Hindi language, Office Management and excellent communication skills is necessary. To pass Shorthand Test at a speed of 100 wpm in English and Computer Typing Test at a speed of 35 wpm in English respectively. 19. Trainee Mate (Agri. ): A passed of Intermediate in Agriculture/Sr. Secondary (12th) or equivalent in Science with Biology as one of the subjects with sound physique. Knowledge and experience in agriculture related field will be desirable. 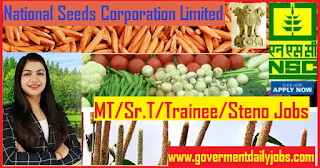 AGE LIMIT: Candidate’s required age should not exceed 25/27/30/50 years as on 09-02-2019 for National Seeds Corporation Recruitment 2019 | Apply for 264 Trainee Posts. 1. Deputy General Manager: Below 50 years. 2. Assistant: Below 30 years. 3. Management Trainee/ Senior Trainee/Diploma Trainee/Trainee: Below 27 years. 4. Trainee Mate: Below 25 years. 1. Deputy General Manager (DGM) (Vigilance): Rs. 70000/- pm. 2. Assistant (Legal) Grade-I: Rs. 22000/- pm. 3. Management Trainee: Rs. 43520/- pm. 4. Senior Trainee: Rs. 23936/- pm. 5. Diploma Trainee: Rs. 23939/- pm. 6. Trainee: Rs. 18496/- pm. 7. Trainee Mate: Rs. 17952/- pm. REQUIRED APPLICATION FEE: For said vacancy a non-refundable application fee is to be paid by the candidates as per rules. An amount of Rs.525/- by General & OBC candidates and Rs. 25/- by Scheduled Caste (SC)/ Scheduled Tribe (ST)/ Divyang / Women candidates to be paid through Debit Card/Credit Card/Net Banking. उत्तर प्रदेश पुलिस में 2065 पुरुष फायरमेन तथा 3638 पुरुष एवं महिलाओं के लिए जेल वार्डर एवं 102 आरक्षी घुड़सवार पुरुष पदों की भर्ती हेतु आवेदन आमंत्रित किये हैं इच्छुक उम्मीदवार यहाँ आवेदन कर सकते हैं। आवेदन करने से पहले पूर्ण अधिसूचना यहाँ पढ़ें – 5766 vacant posts of Jail Warder, Fireman & Constable Horse Rider through Uttar Pradesh Police Recruitment and Promotion Board (UPPRPB), Lucknow. LAST DATE TO APPLY: 09-02-2019. • Management Trainee: Written examination, Based on the merit of written examination, candidates will be called for interview and document verification. • Others: Written examination, Based on the merit of written examination/skill test, candidates will be called for document verification. Based on the written examination marks, the candidate will be finally shortlisted for selection. Written examination (Offline): 03 March 2019. HOW TO APPLY: For said posts (NSC Recruitment 2019 Management Trainee & more 264 Posts) eligible, willing and interested candidates may apply through online mode at official website up to last date. Applicants must retain a hard copy for future reference. 1. On the website, go to the “Careers” section. 2. On the Careers page, find the link which you wish to apply for. 3. Start by filling in the Application form. 4. Make sure that you are filling all the details correctly, once you start filling the application form. 5. Attach your documents which are required by the system. Also, put in your scanned photo and signature and upload them onto your form. 6. Pay your application fee and complete the process. 7. Take a print out of NSCL Recruitment 2019 application form for future reference. CONTACT ADDRESS: National Seeds Corporation Limited (NSCL), Beej Bhavan, Pusa Complex, New Delhi- 110012/Phone No. : +91-11-25840115. CONCLUSION: National Seeds Corporation Limited (NSCL), New Delhi invites online application for the recruitment of 264 vacant posts of Deputy General Manager (DGM) (Vigilance), Assistant (Legal) Grade-I, Management Trainee, Senior Trainee, Diploma Trainee, Trainee and Trainee Mate on regular basis from Indian residents who are eligible & interested; candidates can apply through online application. LAST DATE TO APPLY: 09-02-2019 for NSC Recruitment 2019 Apply 264 Latest NSC Trainee Vacancies.